Younger classes this week were presented with a variety of activities to end the term. 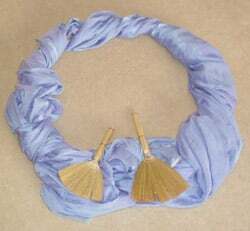 We began with fabric wrapped hoops as nests on the floor with little brooms...the dancers were very tidy birds that loved to keep their nests clean and also liked to clean each others nests. Cats came into the garden and stretched, pounced, cleaned themselves, scampered after leaves in fact did all things that cats like to do. They were a bit noisy so they were shooed away which meant the frogs could sit happily on their rocks (cushions) quickly poking their tongues out to catch flies before jumping across the pond. Finally there were some mysterious eggs in the garden which hatched strange creatures that moved in unusual ways. Older classes built on the egg hatching idea adding traveling and changing as the creature matured. Then the idea of adaptability was introduced as no creature wanted to not belong so dancers had to adopt other creatures characteristics to become part of the group. These then became group movements. We took a few moments to explore suspension as if something was just out of reach before two new choreographers had their turn of directing a small dance created from these elements.